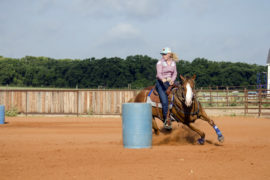 Barrel Racers, Team Ropers, and Vets, Oh My! My boyfriend learned an extremely valuable (i.e., expensive) lesson the other day. Never let a barrel racer take your rope horse to the vet. I had plans to write this blog recounting the time this week when Cinco decided that the water I was offering him after his run was in fact a deadly poison. Instead, I want to write about riding the horse you’re on. With the terror of judgmental stares hovering down on me I’ve never gotten up off of the ground so fast in my life. Admiring someone else’s style doesn’t require you to completely copy them. Sometimes you try to lope a circle but it’s more like kayaking a diamond. The mental anguish I felt was intense. I’ve done everything correctly. I’m on a deadline. I can’t have a setback like this! I imagine you’ve had times in your life you’ve felt this way, too. Who would have thought the ground could be so scary? I almost cried in my trailer last night. It wouldn’t be the first time; I’ve actually hung an extra towel in there in case the floodgates open. Over the last several years, frustration, depression, and embarrassment have all found an outlet in that tiny tack room. Wow, I am not qualified for this. How did this happen? How am I suddenly in charge of making sure this really nice horse successfully reaches adulthood and turns into a productive member of barrel racing society?